The Rada Kitchen Store provides a convenient source to purchase Rada Cutlery products for your personal use or gift giving. Orders can be placed at Rada Kitchen Store or by calling 1-888-771-7798. Cooks have enjoyed using Rada Cutlery since we started manufacturing kitchen knives and utensils in 1948. Rada Cutlery was originally sold exclusively through fundraising groups and then later sold also by independent sellers. The Rada Kitchen Store outlet was requested by people who did not have a local source for Rada Knives but wanted to add to their collection. 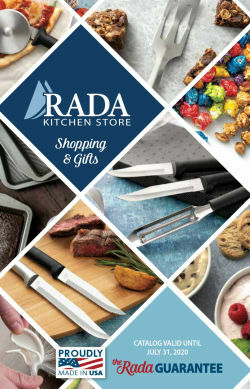 We invite you to shop for Rada Cutlery products in the way that is most convenient for you — The Rada Kitchen Store web site or catalog, fundraising groups or independent sellers.